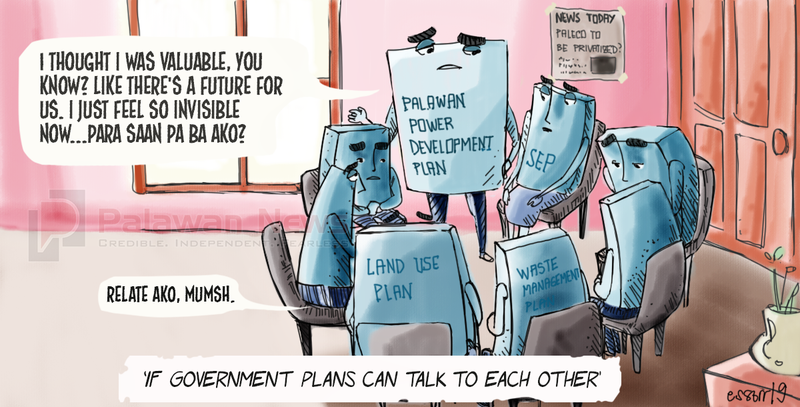 The Palawan Island Power Development Plan (PIPDP) is the energy masterplan for the entire province of Palawan, crafted in 2014 and presently serves as the medium and long-term reference for the power sector. It was an outcome of a tedious planning process preceded by the creation of a Joint Energy Development Advisory Group (JEDAG) through Executive Order 2013-1 issued by Governor Jose Ch. Alvarez. The masterplan was a product of technical deliberations by a wide range of stakeholders and policy planners, including members of the academe, the military, the business sector, non-government organizations, and local and national agencies. The plan was formally adopted by the provincial government during a Palawan Power Summit meeting held on January 24, 2014, and promptly recognized by the Department of Energy which also actively took part in the JEDAG deliberations. According to the document’s executive summary, the plan outlines and details the island province’s response to its power supply requirements for the next 20 years, based on its long-term perspective concerning the province’s energy needs. The plan further estimated its overall investment requirement at P54.03 billion, broken down as P26.82 billion for power generation initiatives, P4.06 billion for power distribution and P16.89 billion for upgrading the main grid transmission system. Specifically concerning the distribution of electricity to Palawan’s end users, the plan prescribes for the rehabilitation and upgrading of the existing distribution system of the Palawan Electric Cooperative and the Busuanga Island Electric Cooperative (BISELCO) in the Calamianes. What is important to consider in this plan is the fact that it went through a rigorous and robust process of review and studies and that the strategies and interventions prescribed in the document were carefully vetted by all stakeholders involved, including the provincial government. Which brings us to the question of why suddenly the provincial government has taken an altogether different direction in addressing Palawan’s power situation. At least this was the implication of Gov. Alvarez’ statement in a radio program last week that he was the one who asked the Palawan congressmen to file a bill in Congress revoking the distribution franchise of the Palawan Electric Cooperative and granting the same to a private company, the MORE Reedbank Corporation. Gov. Alvarez justified this direction, arguing that PALECO being a cooperative is not in a good position to manage the task of power distribution, mainly because it does not have the necessary financial muscle to bankroll an efficient distribution facility. While the governor may have a point, considering that even PALECO admits that the current problems they are facing were rooted in the delay of the approval of their capital expenditure plan by the Department of Energy. Basically, if only PALECO has its own funding, they don’t have to wait for the DoE to clear them for a loan from the banks. But whether privatizing PALECO or the electric franchise in Palawan has been deemed as a solution to the power challenges of Palawan was never discussed or covered in the abovementioned energy masterplan. If the provincial government saw that as a problem, it is now but an afterthought to the rigorous planning process that went before. Since the cards are already on the table and the bill has been filed in Congress, and even the DoE has indicated it also plans to evaluate the performance of PALECO along with other cooperatives with the end in view of canceling their franchises, perhaps it should help if the provincial government and the DoE re-convene the JEDAG and its stakeholders to take a second look at what they had formulated before and evaluate the direction that the provincial government now wants to take instead. At the end of the day, it would help to answer a lot of questions about what privatization means to Palawan’s electric consumers, as opposed to what the status quo with Paleco will entail. There has to be only one plan and a single strategy, properly rooted to a development agenda, with all the important stakeholders on the same page.